Whether you're looking for inspiration to tackle your own renovation project or simply want to see what can be achieved when renovating a period apartment, you're sure to love Michelle and Ross's Malaysian inspired space. Once you've finished looking through their gorgeous first home together, make sure to check out more of our real home renovations. From restored period properties to contemporary self builds, there's something to suit every taste. Read our guide on renovating a house, too, for more guidance. Having grown up in Malaysia where most properties have very high ceilings and are arranged over at least two floors, the apartments they initially viewed felt cramped to her in comparison. The property was in need of extensive renovation, which the couple funded through their savings. Every room was taken back to its bare bones and the apartment was completely rewired, replastered and replumbed. The windows were also all replaced with traditional sash designs more in keeping with the property’s historic location. ‘It was little more than a building site for seven months, so it made sense to continue living in our rental while the work was completed,’ says Michelle. The renovation work threw up some unpleasant surprises, particularly when the couple discovered that a supporting wall in the living room had been illegally removed in the past, which meant they had to pay for steel joists to be inserted to support the floor above. More welcome discoveries included finding the original stone walls hidden underneath the old plasterwork. The exposed brickwork helps to visually link each of the spaces and Michelle has emphasised this connection by opting for a colour palette of grey tones throughout. Thick pile carpet and cosy leather seating create an air of understated luxury. Michelle has introduced accessories from her parents’ home in Malaysia for an appealing blend of Far Eastern and Western styles. On the top floor of the apartment, the rooms have been opened up into the eaves, creating a greater sense of height. ‘Our builder, Andrew Tchir from GAT Development, gave us so much great advice to maximise the potential of the space,’ enthuses Michelle. The master bedroom used to be two separate rooms but the couple knocked through to create one light and airy room with a dressing and seating area at one end. 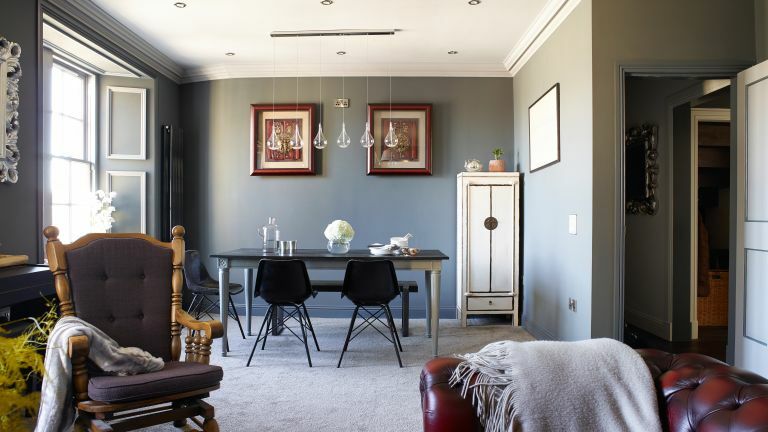 Floor-to-ceiling mirrored wardrobes, a small sofa and a coffee table create the boutique hotel look Michelle was after. The top-floor bathroom benefits from extra large skylights that give rooftop views. Michelle and Ross had planned to section off the statement bath and shower with a glass screen, ‘but as the rest of the room doesn’t get wet when the shower is used, we lost the door,’ Michelle explains. Looking to get started on your own renovation project?